Marketing Material - Thought Leader or Entertainer? Do I Need a Big Budget for Digital Marketing? 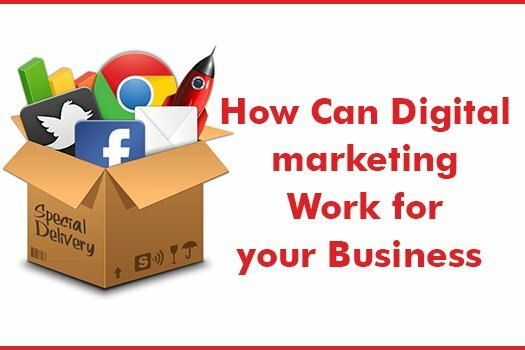 Digital marketing can work for any business in any industry. Regardless of what your company sells, digital marketing still involves building out buyer personas to identify your audience's needs, and creating valuable online content. However, that's not to say that all businesses should implement a digital marketing strategy in the same way. 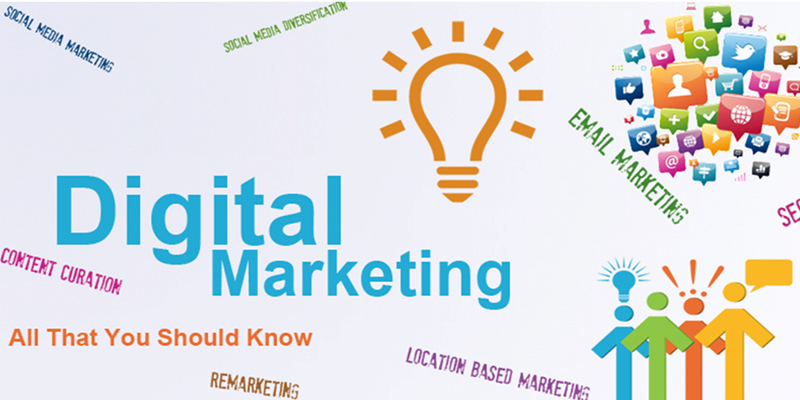 The field of marketing is buzzing with the festivity of digital marketing. The prevalence and proficiency of digital marketing have changed the landscape of advertising. Now, the consumers are more focused on the marketing campaigns instead of the product being marketed. The term digital marketing was first utilized in the 1990s, but you can trace its roots back in 1980s where ChannelNet, formerly known as SoftAd Group, developed advertising campaigns for the automobile companies. It became more sophisticated in the 2000s, and today, the proliferation of digital devices has made it a must-have component for all online marketing strategies. This umbrella term used for commercialization of products and services through digital technologies, particularly the internet, also includes advertising through a mobile phone, display and other digital mediums. In short, digital marketing is an all-mighty gateway between electronic technology and marketing psychology. If you want to master and manage the information going out and into this gateway, you have to make sure that a digital marketing strategy is integrated into your marketing plans. There are different types of digital marketing, but in this article, we are going to dig the ground for exploring the fundamental differences between the two major types of digital marketing, i.e., B2B and B2C. 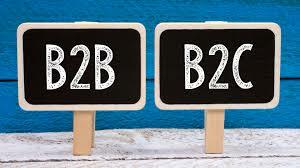 B2B stands for Business to Business marketing, which is based on same B2C (Business to Customer) marketing practices, but it has slight modifications due to the nature and characteristics of B2B commerce industry. Although, there certainly is some overlap between these two marketing strategies but a few key differences are also there which can either make or break your overall online marketing campaign. The B2B audiences are tech savvy, accustomed to being bombarded with information and they are short on time. The exploitation of social media marketing in case of businesses is also different from the one used for the customers. On the other hand, digital marketing, in the case of B2C, is all about entertainment and fun for selling products and services. Let's have a look at some key differences between B2B and B2C marketing and leverage them to get the best out of digital marketing. In the past, there were much more differences between these two types of marketing strategies because the primary method of research and point of contact differed greatly. The ground level basis was used by marketers to reach the customers. On the other hand, businesses used to be more formal and restricted in their methods of reaching out. But today, the situation is completely different; both the businesses and the consumers are capable of working and researching their problems on the internet. A whole new expanse has opened up the opportunity for reaching out and making contact with potential new customers. In the realm of digital marketing, the method of reaching out and contact is nearly identical. A few significant changes suggest that the marketers have to make use of industry jargons for excellent effects on B2B platforms. The B2B marketing process is designed for efficiency and expertise seeking audiences. The B2B purchase process is more rational and logical as compared to the emotionally triggered consumer choices in case of B2C marketing. The B2B buyers are top managers or owners of their respective companies. They are more sophisticated and gain an in-depth understanding of the service being offered by the marketers from an organisational perspective. They have an interest in a particular offer with an objective to grow their own company. Therefore, the marketers, when conveying a message through digital media, have to define how the managers or business owners can boost profits, save money and stay competitive in the long run using their product. In such case, the content must have to be thoroughly researched, and the marketers are required to give the audience a reason to utilise their product and service being marketed before it's too late. However, typical B2C buyers look for the best price available. They tend to purchase from the most trusted retailer. So, in this case, the marketing content and the website have to convey a feeling of confidence and security to the buyer. That is why the design of the site and the substance matters the most. The consumers are likely to opt for trusted sources for purchase. Therefore, in the case of B2C marketing, the digital marketers have to give priority to trust, security and brand loyalty. The size of the market is another important consideration in the field of digital marketing. When we talk about B2C marketing, the target market is larger and takes a major sector of the public, i.e., millions of customers are included in this case. On the other hand, in B2B marketing, you are targeting a particular niche, i.e., the number of clients is in thousands only. Hence, the differences in the size of the markets for both cases suggest that the content has to be appealing to the particular market that the company is aiming to target. 4. Marketing Material - Thought Leader or Entertainer? B2B marketing means you must have to understand the operational activities of the organisations which you are targeting. It is also essential to know who will be looking at your content and website. In B2B sector, there is a tremendous thrust for knowledge because the business owners are focused on growth and expansion of their companies. Your product will get an active appreciation if it is capable enough to contribute to their development. You have to provide the marketing material to lay out the foundation about how your product and services can save time, money and resources of your client. To captivate B2B customers, you must have to provide the relevant content which the businesses are actively searching for, and relate it with your offerings. Whereas, B2C marketing is all about entertainment. Your customers are not going to follow the posts having too much of sales pitch. Only the genuinely exciting, emotional and funny content can keep the masses happy and content. In the case of B2C marketing, the marketers must have to utilise the social media channels with a personalized and lively touch. By just being a mere faceless corporate entity will only make you lose a significant number of customers in the long run. From a client's perspective, B2B and B2C both are just types of marketing to people like you and me. However, being a professional doesn't mean that you cannot have fun. Marketing to the public does not say you cannot take advantage of B2B methods. Though both are different, you can utilise both at the same time. B2B digital marketing strategy has a slightly different perspective involving long term relationship when compared to the social media strategy in B2C digital marketing. B2C companies flock to Facebook to reach wider audiences, on the other hand, B2B companies gravitate towards LinkedIn as a way to establish networks with active connections. In B2B digital marketing, the utilization of newer and trendier social media networks like Snapchat is not suitable in any way because teenage consumers are the possible demographics of this type of social platform. I am not saying that B2B marketers do not or should not use Facebook for promotional activities. My point is that they have to opt for the best social media marketing approach that targets the exact relevant audience for them. The ultimate target of B2C marketing is to 'sell' the products and services to target consumers. On the other hand, B2B marketers tend to look for ways to establish long term ongoing relationships with their customers. The main aim of B2B marketing is to focus on generating lead and keeping up the long term relationship through emails, blogging and other strategies. B2B is all about building trust and sharing information with each other. It means that the marketers should communicate with their contacts for building a mutually beneficial relationship. B2C marketing requires making use of various exciting videos and tweets to entertain the target audiences. However, in the case of B2B marketing, the sole purpose of marketers is to spread information. The target market of corporate buyers includes industry savvy customers, and they seek information that can help them to grow their businesses. Facts and figures drive business customers. They want logic instead of a typical advertising strategy. If you are building an online media campaign, then it is important to keep in mind the interests and needs of your customers. Try to use info graphics, factual links and statistical reports to back up your claims. Capturing the attention of your audience in both cases is entirely different from each other. In the case of B2B marketing, the marketers try to capture the attention of smaller markets over the longer period as compared to the marketing done in the case of B2C approach. 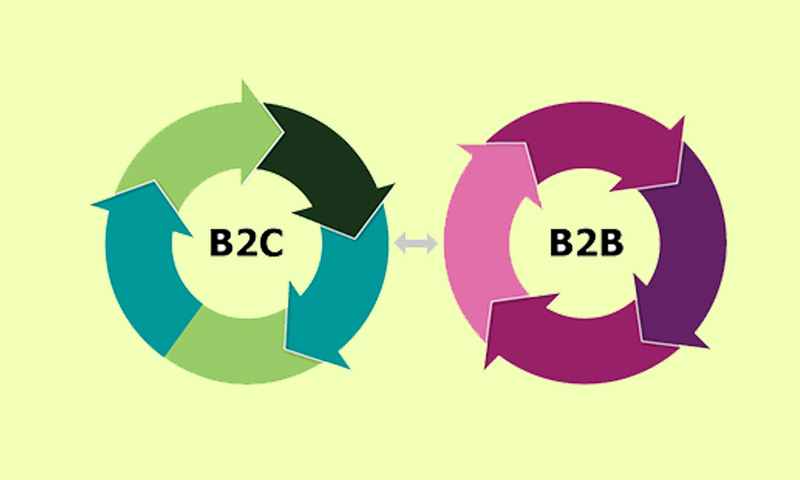 The sales cycle in case of B2C marketing is relatively lower than the sales cycle in case of B2B. Similarly, business transactions need more consideration as compared to B2C operations and require a high level of trust and bond between the customer and the supplier. The sales cycle for B2B typically starts with driving traffic to the website for finding potential clients. Whereas, the B2C sales cycle is based on a single step purchase. In this case, the customer wants a brand to be perfect. So, for B2C marketing, you should give your clients a reason to buy your product. By providing a branded content, the organizations want to create a favourable impression on their consumers. A little piece of an interesting content sufficiently evokes an emotional and political responsiveness among the customers. For instance, Procter & Gamble is successfully creating a forward thinking impression on its consumers. It markets products for entertainment and opts for emotional response option from them. This behavior reflects their B2C digital marketing strategy. On the other hand, in the case of B2B digital marketing, the marketers tend to provide a general overview. For this purpose, e-Books, whitepapers and other forms of downloads, such as template and documents, can be used to add more worth to your brand. These valuable sources incredibly contribute in enhancing your brand promotions. Moreover, to increase brand value, developing online public relations is considered as an integral part of B2C marketing, but it is not sufficient in the case of B2B marketing. In the case of B2C marketing, the marketers strive to get mentioned in various industry publications and blogs for to be read by their target audiences. In this instance, applying some fruitful strategy for media coverage can be a better option. Other than that, you can communicate via interviews, arrange meetings and write advertorials to increase your PR. Whereas, in the case of B2B marketing, a routine surveillance of industry related media outlets is required to enhance public relations. The content is an integral part of digital marketing. Whether it is B2B marketing or B2C marketing, content plays a significant role in marketing and advertising your brand over the internet. While sharing or writing the content for B2C audiences, the marketers should have to keep it short. They need to make it as much humorous and catchy as possible to appeal a large number of readers. On the contrary, in the case of B2B marketing, a more detailed, informative and lengthy content is required because the marketers are expected to show off their digital expertise, they have to inform and inspire their prospective buyers. If your company is B2B, your digital marketing efforts are likely to be centered around online lead generation, with the end goal being for someone to speak to a salesperson. For that reason, the role of your marketing strategy is to attract and convert the highest quality leads for your salespeople via your website and supporting digital channels. Beyond your website, you'll probably choose to focus your efforts on business-focused channels like LinkedIn where your demographic is spending their time online. If your company is B2C, depending on the price point of your products, it's likely that the goal of your digital marketing efforts is to attract people to your website and have them become customers without ever needing to speak to a salesperson. For that reason, you're probably less likely to focus on 'leads' in their traditional sense, and more likely to focus on building an accelerated buyer's journey, from the moment someone lands on your website, to the moment that they make a purchase. This will often mean your product features in your content higher up in the marketing funnel than it might for a B2B business, and you might need to use stronger calls-to-action (CTAs). For B2C companies, channels like Instagram and Pinterest can often be more valuable than business-focused platforms LinkedIn. As with anything, it really depends on what elements of digital marketing you're looking to add to your strategy. Presuming you already have a website, if you're focusing on inbound techniques like SEO, social media, and content creation then the good news is you don't need very much budget at all. With inbound marketing, the main focus is on creating high quality content that your audience will want to consume, which unless you're planning to outsource the work, the only investment you'll need is your time. With outbound techniques like online advertising and purchasing email lists, there is undoubtedly some expense. What it costs comes down to what kind of visibility you want to receive as a result of the advertising. For example, to implement PPC using Google AdWords, you'll bid against other companies in your industry to appear at the top of Google's search results for keywords associated with your business. Depending on the competitiveness of the keyword, this can be reasonably affordable, or extremely expensive, which is why it's a good idea to focus building your organic reach, too.